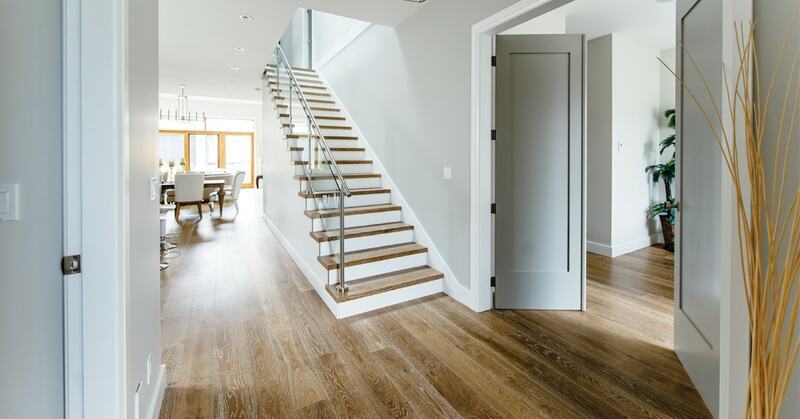 Laminate, engineered wood or cork floors, otherwise known as "floating" floors, are easy to install and can be laid over most types of subfloor, except for carpet. Before you purchase the floor planks, calculate the surface of the area you want to cover and add from 10 to 15% to allow for breakages and spares. Store the planks flat in their boxes in the room, for at least 48 hours before you start the installation. The planks will have time to acclimate to the room’s temperature. Prepare the surface by ensuring it is clean, dry, smooth and level. Before installing the floor, take out the mouldings, then lay a polyethylene foam underlayment. For concrete surfaces, use a polyethylene moisture (or vapour) barrier sheet as underlayment. 1.1 - Lay a plank next to the door casing and draw a line at the height it needs to be cut and allow flooring to fit underneath. 1.2 - Cut the casing with a backsaw or multi-function tool and slide the floor plank under the casing to check the height. 2.1 - Determine the alignment of the planks and draw reference lines on the floor. 2.2 - Calculate how wide your last row will be and make sure it respects manufacturer's recommendations regarding the minimum width of planks. This is important to ensure planks will stay in place. 2.3 - Draw reference lines on along the walls to include a 5/16 in expansion gap between the line and the wall. 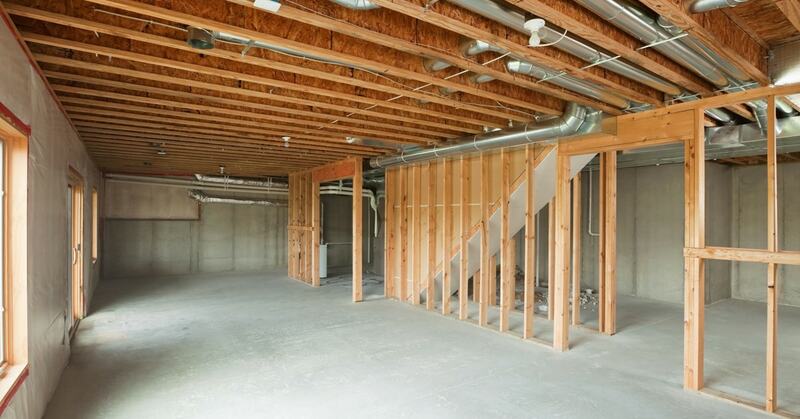 We suggest that you follow the manufacturer's recommendations to install your floor. 3.1 - Starting in one corner, lay the first plank with the male sides facing the wall. 3.2 - Following manufacturer’s instructions, install all pieces in the first row. 3.3 - Use spacers to keep the 5/16 in expansion gap between the planks and the walls. The recommended gap may vary depending on the manufacturer. 3.4 - Install the other rows, mixing planks from different boxes in order to ensure even colour-shading. 3.5 - Start each new row with a piece left over from the end of the previous row. 3.6 - Check that the previous row is perfectly straight and square before installing the next row. 4.1 - Measure the width of your last row and cut the planks to finish the installation. 4.2 - Use a pull bar to insert the final row and make sure to keep the required expansion gap. 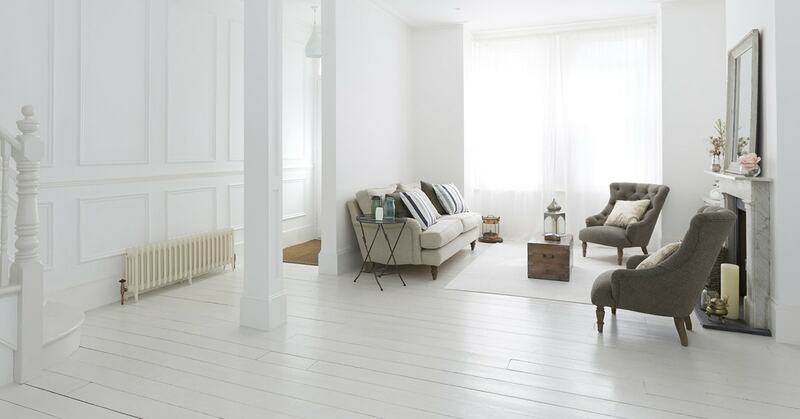 Your flooring would not be complete without elegant baseboard trim. Read our Install baseboards article for all the details of this project.